Question: What is temporal triangular alopecia and how do you treat it? Answer: Hi, Ethan. Temporal Triangular Alopecia is also known as Congenital Triangular Alopecia. It is a non-scarring (non-cicatricial) form of hair loss that can affect men, women and children. It tends to appear as a single triangular, oval or lancet-shaped patch. This is predominantly located in the frontotemporal region of the scalp (the areas marked as number 5 on the diagram below), more commonly known as the areas around the temples. Although it can develop at any time, it may present from birth, and once it has arisen, the patch generally remains throughout a person’s lifetime without changing. Temporal Triangular Alopecia is painless and tends to have no other associated symptoms, other than the obvious vellus hairs in one of the aforementioned patterns. According to a 2015 article in the International Journal of Trichology, in rare cases, this type of hairloss has been associated with Down’s syndrome and phakomatosis pigmentovascularis. 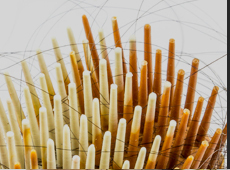 The etiology of this particular hair loss condition remains a mystery – as is the case with Alopecia Areata – but it can be diagnosed by a visual assessment of the scalp; a biopsy is not necessary. Although it causes hair loss near one temple, it differs from thinning edges as this term generally refers to a receding hairline from the permanent, progressive genetic conditions, Male Pattern Baldness or Female Pattern Hair Loss. It can also mean frontal hairloss caused by Traction Alopecia, a condition generally caused by over-wearing tight hairstyles, weaves or hair extensions. 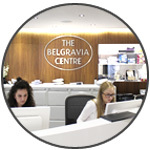 We do not treat Temporal Triangular Alopecia at Belgravia. The reason for this is that, unlike these other conditions, even with a customised course of pharmaceutical hair loss treatment, the hair will not regrow. The only possible option for those wishing to address this condition at present, is potentially hair transplant surgery. This approach depends entirely on the individual’s suitability, however, so it is best discussed with specialist surgeons with experience in this area. In many cases the balding area can be disguised with a clever haircut – something your hairdresser or barber should be able to discuss with you – and/or the use of dedicated hair loss concealing products. You can also find out more about Temporal Triangular Alopecia from your GP or dermatologist though Belgravia hair loss specialists can also diagnose the condition and refer patients on to a highly reputable hair restoration surgeon, if required.